Healing Resonance Articles by Kristi Borst: Turning "Why Me?" into "I AM"
Once I consciously recognized this, I was able to both shift my focus and the amount of energy I was allocating to the "bad stuff". Then I came to the space of knowing that life isn't "good" or "bad" ... life is neutral. It is our reception and perspective ... our filters ... that make things appear to be "good" or "bad". Yet we don't always know the entire picture, do we? I dare say we probably won't until we pass from this physical plane of existence. I invite you to look at some of the things that have happened in your past ... the past is sometimes easier to see more clearly since it can be less emotional than the present "drama" with which we are interacting. Take a look and find a "traumatic event" you experienced as an adult. Perhaps initially it looked devastating, yet ultimately it served you well. Perhaps you lost a job, lost a loved one, faced financial hardship, your body began presenting symptoms of a physical disease. These dramatic, life-changing events are many times exactly what was needed to propel us to our greatness ... to shift us onto a more meaningful path ... or to force us to stretch and grown and uncover strengths we would never have found otherwise. Consider this. If life is going smoothly and easily, what motivation is there for change? For growth? Situations which we can easily see as "bad things that have happened to us" may in fact be things that have "happened FOR us". After I had started working with people and helping the to heal mentally, emotionally, spiritually, and/or physically, I experienced first hand the connectedness that runs in/of/through us. Peace for me came from a place of knowing, in every part of my BEing, that there is a Divine Plan of Perfection and that God/Source/The All That Is = Love. Ultimately, this is my FAITH. The good news is that it truly does take faith only the size of a mustard seed to be happy ... the hard part is surrendering to that Higher Plan, watching for sign posts that we are on the right track, and grabbing the opportunities that come our way. Sometimes we'll even get into a flow so that life becomes totally effortless! All of my life, it has not been easy for me to "take no for an answer". I'm a pusher of rules, boundaries, expectations. So why not break the rules on good/bad? Why not say "I'm not going to that space of feeling bad ... I've ridden that wave and didn't like the trip." Rather than complain, mope, or give up, I can choose a different experience ... a different dance. This is growth. This type of growth and expansion is much easier when we do it from a space of trusting that, from a Higher perspective, it is for our best. Moreover, sometimes in life it's merely not all about us. Sometimes our getting what we want or think we need would keep someone else from getting theirs. Pure and simple ... when we realize we are all connected, it's easy to both understand that and embrace it! If there is something that is truly bothering you that exists only in the past, at this point, you have a choice in this NOW moment. You can choose how much and what type of energy and attention you are going to give it. That is where your power lies ... right here right now. You cannot change the past, but you can change the way you experience the past! Each and every thing that happened to you has shaped you, but you can decide what DEFINES you! Look at those "skeletons in the closet". Yes, truly, dust them off. But instead of looking at them with scorn, regret, & negativity, see the strength you had as a soul in making it through whatever that challenge was and to get to this space in which you now stand. Ask for patience in changing old patterns Stand in your power. Be the parent/loved one/friend TO YOURSELF that you've always wanted. That being said, I think, as humans, it is important for us to connect with others, share our burdens and our dreams. If you have a burden on your soul, I can help you lighten it. I am here for private session work if you'd like a partner in shifting to a happier and healthier way to experience past/present/future. One of my gifts is in helping others move beyond/clearing childhood traumas, long-buried emotions. May self-love, hope and faith wash over you like the breeze that precedes the cooling summer rains. Image provided with article is "Emerging to Love" ©Kristi Borst. 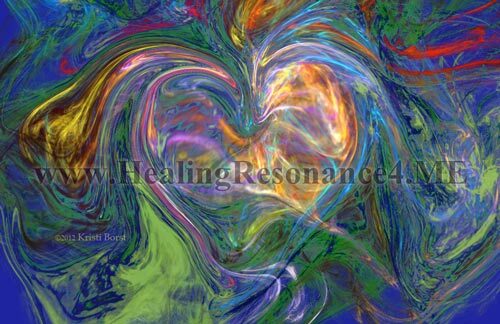 It is one of the metaphysical healing artwork images available on my site.